[135 Pages Report] The auto dimming mirror market was estimated to be USD 1.64 Billion in 2016 and is projected to grow at a CAGR of 3.20% during the forecast period. The base year for the report is 2016 and the forecast period is 2017–2025. The global market is primarily driven by the increasing awareness about vehicle and passenger safety. Also, the trend of integrating additional features in rear-view mirrors has led to a rise in demand for auto dimming mirrors. OEMs have launched new variants in mirrors with advanced features for driver assistance. The research methodology used in the report involves primary and secondary sources and follows a bottom-up approach for data triangulation. The study involves country-level OEM and model-wise analysis of the auto dimming mirror market in various vehicle types. This analysis involves historical trends as well as existing penetrations by country as well as vehicle type. The analysis is projected based on various factors such as growth trends in vehicle production, regulations about the minimum number of rear-view mirrors to be installed in various type of vehicles, and technological advancements in various countries. The analysis has been discussed and validated with primary respondents, which include experts from the auto dimming mirror industry, manufacturers, and suppliers. Secondary sources include associations such as International Organization of Motor Vehicle Manufacturers (OICA), American Association of Motor Vehicle Administrators (AAMVA), Automotive Component Manufacturers Association of India (ACMA), and paid databases and directories such as Factiva and Bloomberg. The figure given below illustrates the break-up of the profile of industry experts who participated in primary discussions. 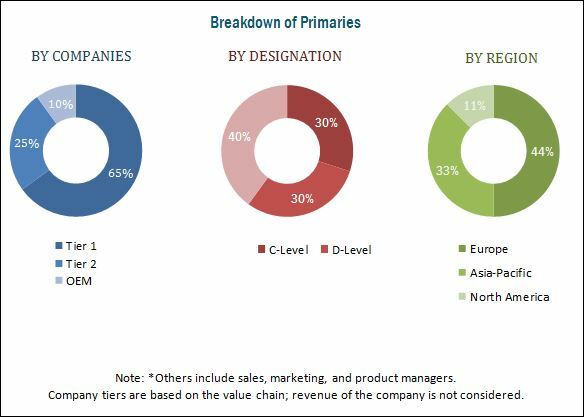 The ecosystem of the auto dimming mirror market comprises manufacturers such as Gentex (US), Samvardhana Motherson Reflectec (Germany), Magna (Canada), Ficosa (Spain), Murakami (Japan), and others. These automotive manufacturers supply auto dimming mirrors to automotive OEMs such as Volkswagen (Germany), General Motors (US), and Ford Motor (US). 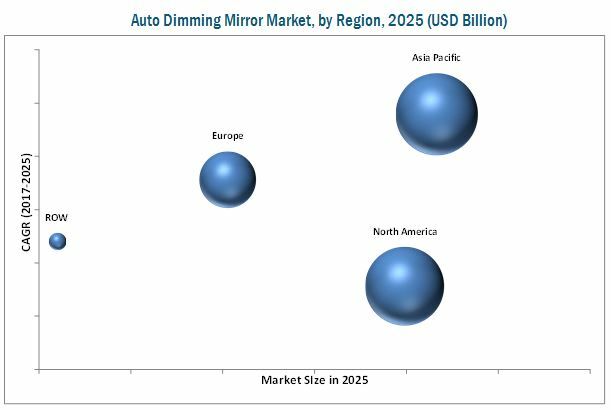 The auto dimming mirror market is projected to grow at a CAGR of 3.20% from 2017 to 2025, to reach a market size of USD 2.11 Billion by 2025. The increasing awareness about vehicle and passenger safety is expected to drive the demand for auto dimming mirrors. The safety of passengers and vehicles has become the prime concern for vehicle buyers. According to the global status report on road safety 2015, more than 1.2 million road traffic deaths occur each year globally. To reduce these accidents, OEMs are integrating different safety features in automotive mirrors. This integration of safety features is expected to drive this market. The outer mirror segment is the fastest growing segment of the auto dimming mirror market, during the forecast period. The use of outer dimming mirrors is imperative in all types of vehicles. Passenger cars commonly have two outer dimming mirrors. However, in the case of LCVs, the number of outer dimming mirrors is higher than passenger cars. Outer dimming mirrors often comprise features such as blind spot detection and turn signal indicator. OEMs are increasingly offering these features in outer dimming mirrors. The connected mirror is estimated to be the fastest growing product of this market. On the other hand, the non-connected dimming mirror segment is estimated to be the largest market. The market for connected dimming mirrors is in the high growth stage. Leading OEMs are adding new features in the auto dimming mirror and are adopting connected dimming mirror to gain competitive advantage. While the connected dimming mirror market is estimated to grow at the fastest pace, the non-connected mirror has the largest market size. Asia Pacific is estimated to dominate the auto dimming mirror market during the forecast period. The region has emerged as a major automotive hub with the majority of the market share of vehicle production as well as sales. Almost every major automotive mirror manufacturer is present in the Asia Pacific region. The demand for auto dimming mirrors is directly linked to the vehicle production in this region. To cater the growing demand and capitalize on cost efficiencies, the companies involved in the production of auto dimming mirrors and their components have started focusing on the Asia Pacific market. Being the largest market for automobiles, the Asia Pacific region is estimated to witness the largest demand for auto dimming mirrors in coming years. A key factor restraining the growth of the auto dimming mirror market is the high installing cost and growing demand for camera and display systems. The connected dimming mirror involves complex interlinking of electronic systems. It also increases the overall cost of the vehicle. If the conventional mirror gets damaged, it is easy to replace and cost-effective. Moreover, if camera and display systems become cheaper and adopted by the OEMs, then this technology can hinder the market for auto dimming mirrors and might make this technology obsolete in future years. Thus, high cost involved and substitutes such as camera and display system is restraining the growth of the market. The market is dominated by a few global players and comprises several regional players. Some of the key manufacturers operating in the market are Magna (Canada), Samvardhana Motherson Reflectec (Germany), Gentex (US), Ficosa (Spain), and urakami (Japan). *Details on Overview, Product Offering, Recent Developments, SWOT Analysis, MnM View Might Not Be Captured in Case of Unlisted Companies.